Visible Ink Press : What Marvel supervillain who debuted in the 1990s later became a favorite anti-hero with a large fan following? What Marvel supervillain who debuted in the 1990s later became a favorite anti-hero with a large fan following? He became insane as a result of the government experiment that gave him his superpowers. His principal superpower is a self-healing ability similar to Wolverine's. His adventures are often satirical in nature, and he likes to crack wise, earning him the nickname "Merc with a Mouth." His alter ego is Wade Wilson. Deadpool is a prime example of a supervillain who not only evolved into an antihero but also became a star of his own comic books. Created by artist Rob Liefeld and writer Fabian Nicieza, Deadpool debuted in Marvel's New Mutants #98 (February 1991), as a costumed mercenary hired to kill the New Mutants and their leader Cable. Deadpool went on to appearances in X-Force and other Marvel titles and became surprisingly popular with the readers. Probably this was because Deadpool became known as the "Merc with a Mouth," since he keeps up a constant stream of wisecracks and banter, as if he were a crazed criminal version of Spider-Man. Deadpool starred in his first comics miniseries in 1993, and graduated to his first ongoing series in 1997. 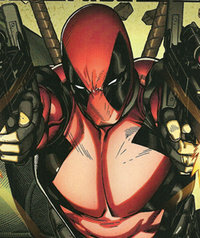 Ever since then, Deadpool has appeared in numerous series of his own and made guest appearances in other Marvel series. As Deadpool became a star in his own right, he became more of an antihero than a true villain. Sometimes he still operates as a criminal, but other times he teams up with superheroes, as in the Cable & Deadpool series (2004-2008), which paired him with a man he had once been hired to kill. In 2011 he joined the superhero team X-Force. Deadpool stories have strong satiric elements, and Deadpool, like John Byrne's version of the She-Hulk, frequently "breaks the fourth wall": he knows he is in a comic book, and will directly talk to the reader. Deadpool's real name is (or possibly is not) Wade Wilson. Suffering from cancer, Wilson volunteered to undergo experiments at the United States government's Weapon X program, which was attempting to create the equivalent of Wolverine's superhuman self-healing ability. The experiments initially, severely disfigured Wilson's face and left him mentally unstable. As a result, Wilson was confined in a facility for rejects from the Weapon X program. There the other inmates gambled in a "deadpool" on who would die next, and they bet that Wilson would die soon. But instead Wilson survived: he developed the healing factor that is his principal superpower, enabling him to recover rapidly from virtually any injury, thus making him virtually unkillable (though he remains disfigured and insane). Adopting the name Deadpool, he became the costumed mercenary who first appeared in New Mutants. Deadpool made his live action film debut in X-Men Origins: Wolverine (2009), in which Ryan Reynolds plays Wade Wilson before he gets his superpowers, and Scott Adkins plays him after he becomes the disfigured Deadpool. In 2011 a Deadpool feature film was being developed, in which Reynolds was slated to play the title role.